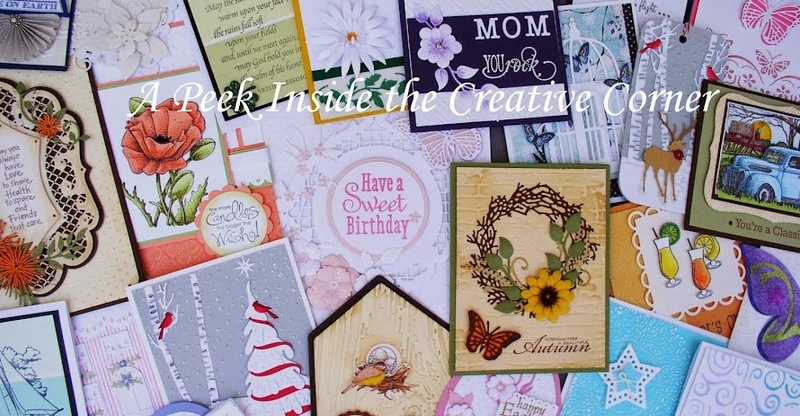 A Peek Inside The Creative Corner: Oh My Gosh, It's November Already! This past Saturday, Sherry Czarnecki, A Muse Art Stamps Instructor, visited The Creative Corner again and held 2 classes. Here, we have some of the ladies working on their fall cards. Most of the techniques were easy, but the results were stunning. These are the completed cards; everyone was very pleased with their results. And while we were working, there was a "Pet Halloween Parade" in town! Unfortunately, Maryanne couldn't be in two places, so she stopped by to show us her entry. And I just loved it --- Rich Witch with her Super Dog!!! And no class is complete without the chocolate treats!!! This time, Hazel the Witch was used to decorate the treat bags ! Lastly, here are the completed cards from the Christmas class. Lots and lots of glitter was used!!! Believe me, it's still all over the store, and I love it. The table and the floor is just sparkling in the sunlight! Thanks to all who came out and stamped the day away. It was lots of fun and great therapy for all!